Diffusion bonded manifolds can be used in a range of medical, life sciences and industrial applications to carry liquids or gases. Users refer to these in a number of different ways including plastic manifolds, bonded plastic manifolds, plastic pneumatic manifolds, plastic air boards, plastic valve manifolds, plastic medical manifolds and plastic flowcells. Our unique diffusion bonding technology makes it possible to fabricate complex and smooth inner flow channels, which is not possible with traditional machining. During the diffusion bonding process, heat & pressure is applied to the materials and uses molecular diffusion to bond them together. 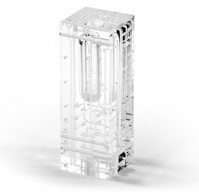 Acrylic/Plexiglas PMMA and other plastic manifolds provide a cost effective and reliable means of transporting or handling liquids and gases. They are ideally suited to applications were fluids must pass between a series of valves, reaction chambers, heater modules, etc. 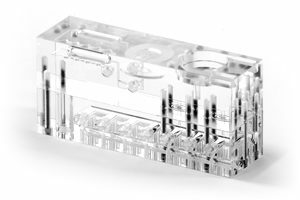 They are an excellent way of simplifying complex systems by replacing multiple tubes, pipes, fittings, connectors and many other components, with a single manifold part. A significant amount of the system complexity and component count can be reduced to a single, highly repeatable part, analogous to the Printed Circuit Board (PCB). Manifolds are often used in medical applications to pneumatically control functions, manage heating and cooling, support ventilation, mix and distribute gasses. They are used extensively in life sciences, IVD applications to move, prepare and analyse samples, manage reagents, buffers and wash fluids, and pneumatically activate various sub-systems and tasks. In industrial applications they are used in hydraulics, vacuum systems, pneumatic control, dispensing, dosing, in-line quality measurement and many other solutions. When a single manifold is used to replace multiple sub-systems and different liquids and gases, the system saving in terms of cost, time and servicing can be dramatic as well as major improvements in quality and reliability. 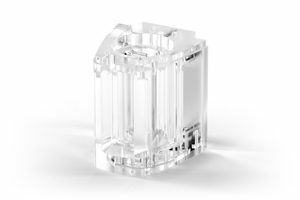 Carville HADB is an enhanced bonding technique developed by Carville allowing plastic manifolds to be produced in Acrylic/Plexiglas (PMMA) and other engineering grade materials such as Polyetherimide (PEI) in a highly repeatable process. The process bonds the plastic together at a molecular level leaving no potential contaminants which is often the case with traditional cementing or solvent methods. The joints are transparent and the final part is around 97% of the tensile strength of the original parent material making it very strong and not subject to deterioration over time. After normalising, pre-bond machining, QA checks, ultrasonic cleaning and annealing, the layers are bonded together primarily with heat and pressure to a carefully controlled time profile. Various post-bond machining operations, annealing cycles, further cleaning, vapour polishing and finishing is performed, before the final inspection and packing ready for dispatch. 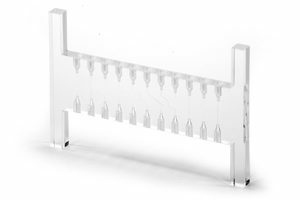 HADB bonding is also used to produce plastic manifolds for microfluidic applications with track sizes down to 150um, often used in clinical diagnostics, medical research and other applications. Examples of plastic manifolds produced by Carville can be reviewed on this page and in the image library.